Fifty years ago, on January 18, 1965, Dr. Marshall W. Nirenberg (1927–2010) completed his first summary of the genetic code—one of the most significant documents in the history of twentieth-century science—a painstaking, handwritten chart of the discovery of how sequences of DNA, known as “triplets,” direct the assembly of amino acids into the structural and functional proteins essential to life. The chart is included in the Marshall W. Nirenberg Papers, held at the National Library of Medicine. Preserving this genetic code chart has been an important and exciting challenge for NLM conservators, as they study the best way to store this important document written on multiple sheets of paper in pencil, India ink, and multiple ball-point pen inks, and held together with adhesive tape. “The DNA that we inherit from our parents contains the information that is needed to make the more than 100,000 kinds of proteins that are the molecular machinery of the body. DNA consists of four kinds of [nucleotides represented by the] letters, T, C, A and G, in long sequences. DNA is transcribed to RNA that also consists of long sequences of four letters, U, C, A, and G. The sequence of letters in RNA determines the sequence of amino acids in proteins. There are 64 kinds of 3 letter words or triplets in RNA. When we deciphered the genetic code, we determined the sequence of letters in each RNA triplet that corresponds to each kind of amino acid in protein. All forms of life on this planet use the same genetic code, although small differences in the code have been found in some organisms. 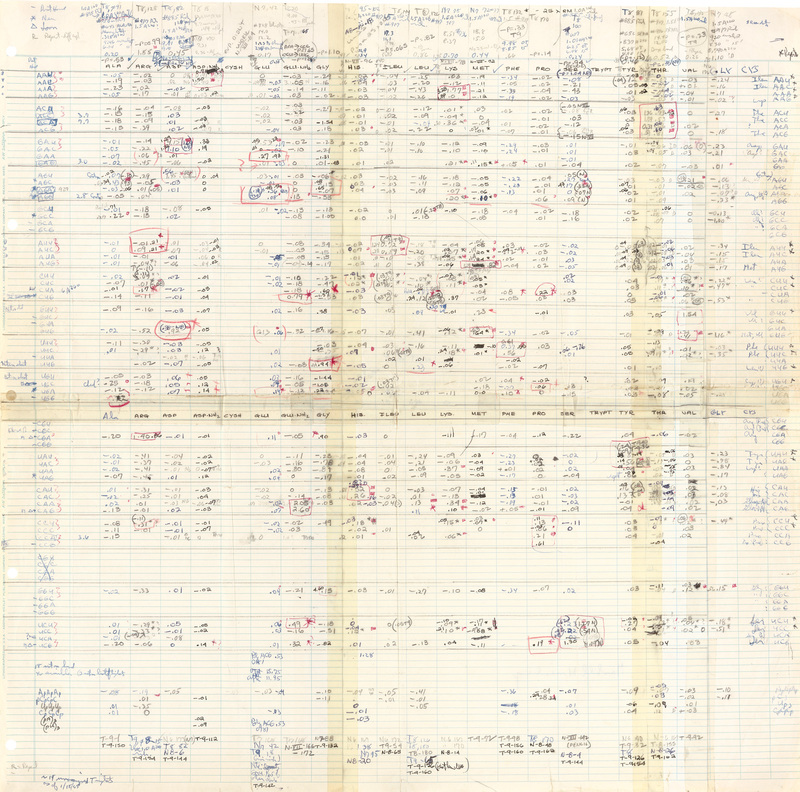 Nirenberg’s handwritten genetic code chart, 1965. 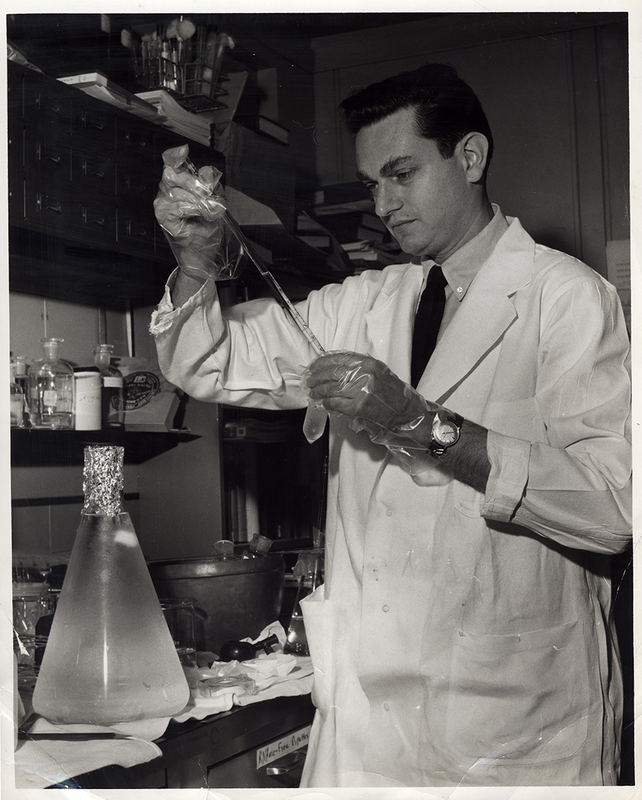 Dr. Nirenberg would go on to win the Nobel Prize in Physiology or Medicine in 1968 for this work, sharing the award with Robert W. Holley of Cornell University and Har Gobind Khorana of the University of Wisconsin at Madison “for their interpretation of the genetic code and its function in protein synthesis.” He began donating his papers to NLM in 1999, and since then nearly 500 selections from the Marshall Nirenberg Papers have been digitized and made available on NLM’s Profiles in Science. Visitors can access archival materials related to the code, including pages from Dr. Nirenberg’s laboratory notebooks, photographs of Dr. Nirenberg in his laboratory, correspondence with other scientists working on the code, such as Francis Crick, and the full 2010 oral history interview with Norma Heaton, in which she recalls the technical challenges of the research, and more broadly, what it was like to work in Dr. Nirenberg’s laboratory during this time. 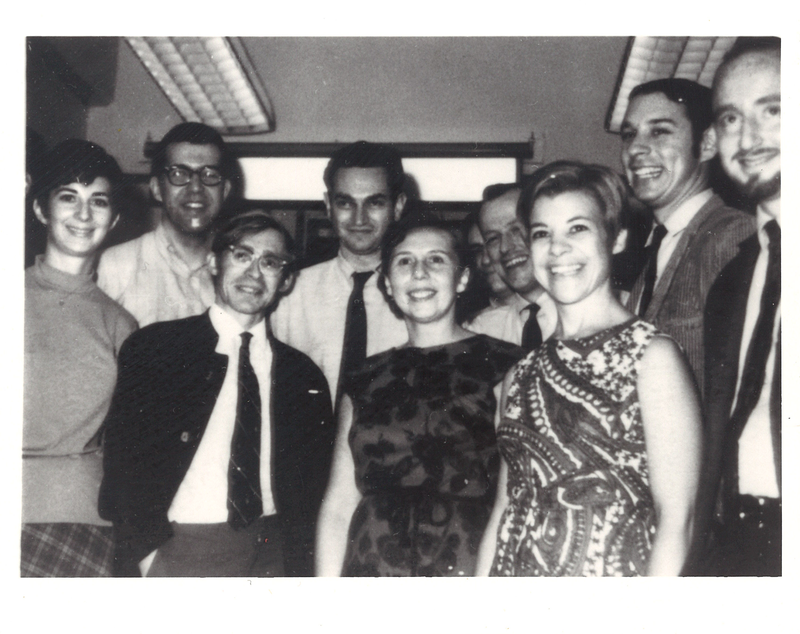 The staff of Nirenberg’s lab celebrating his Nobel Prize. From left to right: Norma Zabriskie Heaton, Ed Scolnick, Mike Wilcox, Marshall Nirenberg, Theresa Caryk, Ty Jaouni (hidden), Wynn Russner (partially hidden), Darlene Levenson, Greg Milman, Frank Portugal. On March 17, 2015 at 1:00, NLM will host a special two-hour program, “A Tribute to Marshall Nirenberg.” The program marks the 50th anniversary of Nirenberg’s Genetic Code Charts—groundbreaking scientific documents now held in NLM’s historical collections. 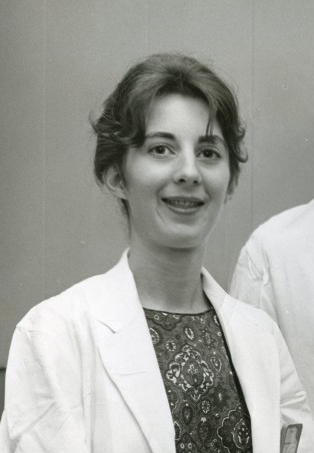 Marshall Nirenberg’s Nobel Prize medal and certificate, newly given to NLM through the generous donation of his wife, Dr. Myrna Weissman, will be on display. Dr. Frank Portugal, author of The Least Likely Man: Marshall Nirenberg and the Discovery of the Genetic Code (MIT Press), and Dr. David Serlin, historian and curator of NLM’s Profiles in Science site on the Marshall Nirenberg Papers, will speak at the event. For more information and directions please visit our 2015 lectures page. Subsequent NIH events will be announced soon. This article is part of a series that commemorates the 50th anniversary of the Genetic Code Charts. Stay tuned throughout the year to learn more about Marshall Nirenberg and these ground breaking documents. 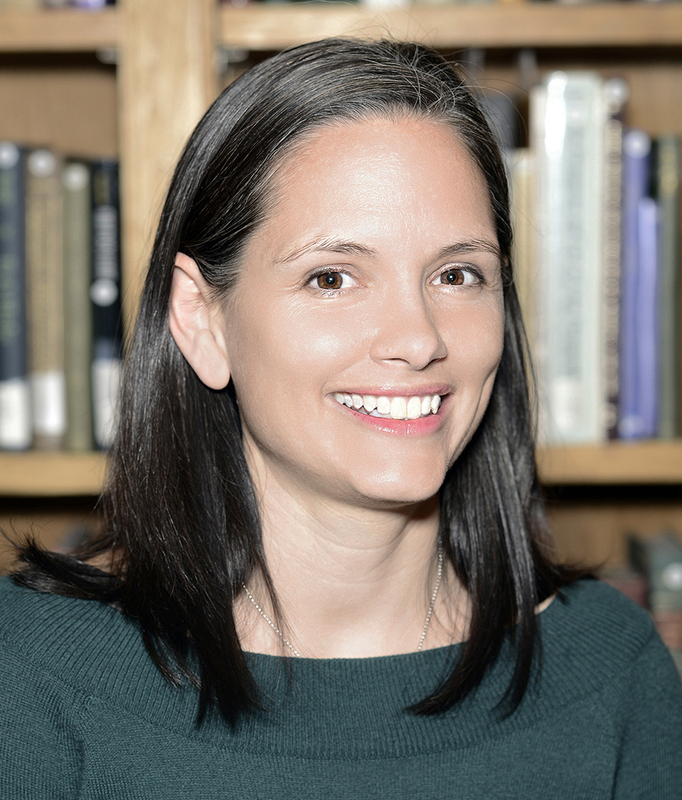 Christie Moffatt is Manager of the Digital Manuscripts Program in the History of Medicine Division at the National Library of Medicine and Chair of the NLM Web Collecting and Archiving Working Group.